'A' Troop Royal Horse Artillery Re-enactment unit. 'A' Troop Royal Horse Artillery, re-enactment unit are members of the Anglesey Hussars. Initially formed for the members of the Anglesey Hussars that were unable to ride, A troop has become an artillery troop which at present, boasts the ability to field four British Napoleonic Field pieces complemented by full crew. The guns, their carriages and equipment have been lovingly made and maintained by group members in their quest to better and improve the accuracy, authenticity and portrayal of such a renowned and respected regiment. The unit prides itself on the continuous research and improvement to the uniforms, drills, guns and most importantly the safe use of cannon in the re-enactment environment. As well as operating British Napoleonic field artillery A Troop RHA also operate several French Napoleonic field artillery pieces when required and also maintain and operate the large garrison guns of Fort Belan in association with Fort Belan and the Friends of Belan Association. 'A' troop carry out displays showing the uniforms, drill procedures and of course firing of our guns. 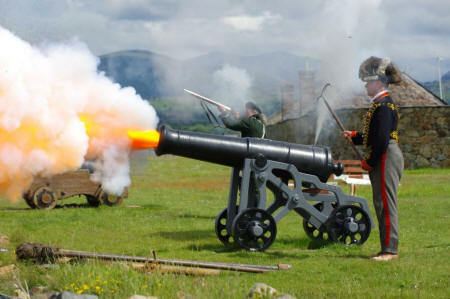 The guns are in much demand for re-enactment / living history displays, battles and ceremonial events such as marking the hour of the day within events, switching on of Christmas lights, starting races and many other such events.